Lopez McHugh has a proven track record of handling referral cases. A number of firms across the country trust us with their referrals and have done so for years. With offices on both coasts and clients nationwide, we are in a position to take on a wide variety of matters. If you need an experienced firm to help litigate a case, contact us to discuss an arrangement—whether referral, consultation, or partnership. We focus on cases involving unsafe drugs and devices, product liability, personal injury, and medical malpractice. We have taken leadership positions in several mass tort actions across the country. A list of mass torts we are currently focused on can be found here. 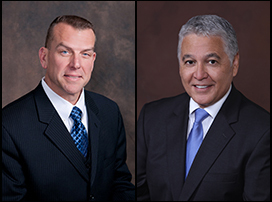 Partners Ramon Lopez and James McHugh have been peer-recognized by numerous organizations including Super Lawyers, “AV Preeminent” by Martindale Hubble, a “Superb” rating by Avvo, LawDragon top 500, and the 100 top trial lawyers of Pennsylvania and New Jersey. Our team also has outstanding credentials. Let us strive to earn your accolades as well. You can call us at (877) 737-8525 to speak directly with one of our attorneys or just use our referral contact form on the right side of this page. We look forward to hearing from you.